Priyanka Chopra and Nick Jonas are winning hearts all over with their adorable wedding photos. People can't stop gushing over how pretty Priyanka looked and how dashing Nick looked during the duo's two wedding ceremonies. The couple tied the knot at the Umaid Bhavan Palace in Jodhpur in a traditional Hindu wedding as well as a Christian wedding. 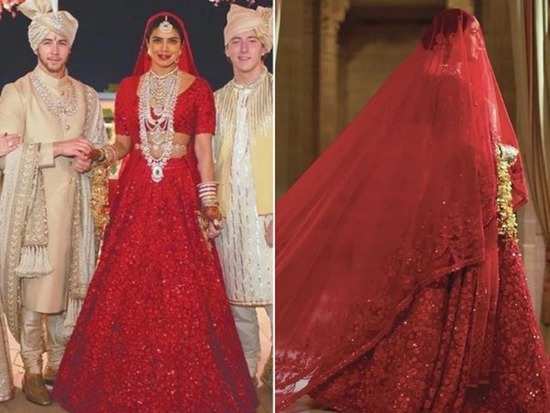 For the Hindu wedding, Priyanka opted for a gorgeous Sabyasachi lehenga in a deep red Kanauj rose hue with intricate French embroidery and fine sequin work. The custom-made ensemble took 3,720 man-hours and 110 embroiderers from Kolkata to create and now, it has been revealed that it was a collaboration between the actress and the designer. Sabyasachi Mukherjee has now taken to his Instagram handle to put up a video of what went into making the gorgeous lehenga. Take a look for yourself. Priyanka teamed her outfit with traditional gold jewellery which included a matha patti, nath, and chura. She also wore an elaborate necklace by Chopard from their ‘Haute Joaillerie Collection’, featuring 184.50 carats of pear-shaped diamonds set in 18k ethical white gold. Doesn't she look mesmerising? Well, we can hardly wait to see what she'll wear to her Mumbai reception. Stay tuned for more updates. 4Who wore this Prabal Gurung ensemble better: Priyanka Chopra or Katrina Kaif? 5The first pictures from Nick Jonas and Priyanka Chopra's wedding are now out! 10Kareena Kapoor Khan or Sara Ali Khan: Who wore Raw Mango better?